Fast, dependable service for all types and sizes of vessels. Pierside and anchorage repairs. Industrial fabrication. Sheet metal and machine shop work. Weldments. Sparrows Point Yard 1 basin 1200 x 200 ft plus 4 ways to 830 ft.
Large crude and LNG carriers: container and other merchant ships; naval auxiliaries; special purpose vessels. Jumboizing and conversion. Offshore mobile drilling platforms. Beaumont Yard 2 sidelaunching ways over 800 ft each. Offshore mobile drilling platforms, workover rigs, and oil production and storage facilities. Barges. Jumboizing and conversion. San Francisco Yard 1 way for construction up to 600 ft x 95 ft beam. Barge design and construction. Jumboizing and conversion. Bethlehem Singapore Private Limited Facilities for building offshore drilling, production, and storage units...plus small cargo ships, dredges, barges, tenders, etc. M iscellaneous fabrication. Mobile Heavy-Lift Floating Cranes —at Baltimore, 275 tons capacity. — at Beaumont, 500 tons capacity. Research and development for the marine industry. Engineering design. Industrial Products • Centralized engine control systems. Deck and engine auxiliary machinery parts. • Glacier-Herbert withdrawable sterngear. • Propeller and line shafts. Rudders, stern frames, tubes, and bushings. Universal mooring chocks. Steel castings. • Fresh water distillers. Condensers and parts. Separators. 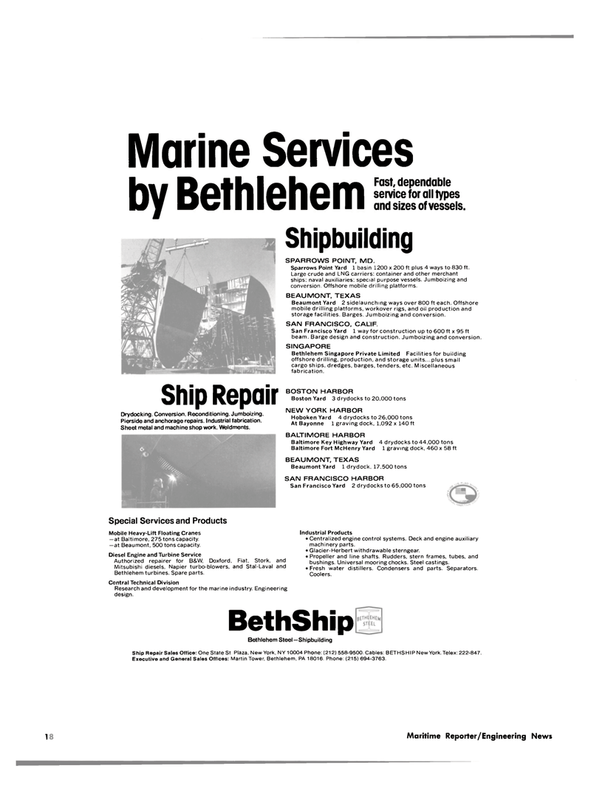 Ship Repair Sales Office: One State St. Plaza, New York, NY 10004 Phone: (212) 558-9500 Cables: BETHSHIP New York. Telex: 222-847. Executive and General Sales Offices: Martin Tower. Bethlehem, PA 18016. Phone: (215) 694-3763.